LANIKAI OCEAN VIEWS! Beautifully renovated in 2017 with new gourmet kitchen, baths, porcelain tile floors, vinyl windows, interior/ext painting, ext private/outdoor shower. Additional highlights include a 39-panel PV system w/Net Metering, 2016 roof, solar water, solar fans, skylights, high ceilings, level grass backyard with majestic old Kiawe tree. Featuring a flexible floor plan with 3 bed/2 baths on upper level and 1 bdrm/1 bath on lower level with int/ext entrances offering rental opportunities for investors or perfect for family and friends. Centrally located just one block to famous Lanikai Beach and in the preferred Ka'oaho (Lanikai) Elementary school district. Furnishings available and turnkey! The perfect spot to enjoy the beach, park, plays, craft fairs..everything Lanikai! Slip into the life of comfort with this island-style gem located in the very heart of Kailua x2019;s prestigious Kamalino xD; xA;community. This spacious two-story home with peekaboo ocean views offers high cedar ceilings, and open wall xD; xA;concept. The roomy living area, a great place to gather, has an easy walk-out to the deck that overlooks a landscaped xD; xA;garden. The dining area includes a convenient pass thru to the upgraded kitchen that offers a x201C;built-in kitchen xD; xA;center x201D;, pantry, laundry and central vacuum system. Ensure fun in the sun with a salt water pool with waterfall & hot xD; xA;tub or enjoy Turtle Beach just seconds away. This home accommodates mutigenerational living and has rental xD; xA;capability with a private entrance. This is the one! Kailua beach town living at its finest. This single-level home is situated on one of the largest lots in the coveted Kuulei Tract neighborhood featuring a private oasis of mature trees and gardens, salt water pool and hot tub. The open floor plan features french doors that open to your expansive front and back yards, an entertainers dream. Relax poolside under the airy canopy of trees and palms swaying in the breeze after a dip in the ocean at world famous Kailua beach just two blocks away. Enjoy the ease of gathering fresh produce and flowers at Kailua x2019;s Farmer's market just steps from your home, as well as Whole Foods, Kailua Recreation Center, eateries, boutiques and the ocean. Ample parking for guests or your boat. View video www.vimeopro.com/mls/272-kuupua. Your beach home awaits. Unique one-of-a-kind property BEACHSIDE Kailua! This amazingly large single family home has 4 bedrooms PLUS a home office AND library/media room. 3 full baths, one with access to the outside to rinse the sand from nearby BREATHTAKING & BEAUTIFUL white sands of Kailua Beach. Chef's kitchen with island, huge indoor pool, spacious living area and cathedral ceilings all add to the ambiance of this original home. Gorgeous ocean views from your second floor master bedroom and living area. 2 large garages and driveway parking behind gate makes for many secured parking spaces. Must see to realize all the potential this home can offer! Enjoy the lifestyle you've been looking for in this beautifully upgraded 4 Bedroom 4 Bath home, located in the premier oceanfront neighborhood of Kaimalino. Situated on a quiet cul-de-sac, this immaculate home features an open floor plan with vaulted ceilings and wood floors throughout. The gourmet kitchen opens to a spacious dining room surrounded by windows and greenery, leading to an outdoor covered lanai. Relax in style with the natural saltwater pool and Brazilian quartzite pool deck on a lush setting and large grassy area. Spacious master suite with a peek-a-boo ocean view deck. Large master bath with travertine floors and a walk in closet. Recently installed wood shake roof with copper rain gutters, freshly painted and split A/C's throughout. A short walk to Turtle Beach and Kailua Bay public access. Close to Award winning schools, shopping & H-3 access. Steps to Kailua Beach, enjoy the LOCATION of this spacious Kalama Tract family home. This spacious 3 bedroom, 2.5 bath residence features your bonus office, family room, fire place, dining room & more! Only your master ensuite with private lanai is on the 2nd floor. Fully gated 8500 sq.ft.level yard features your serene lava rock waterfall,a dolphin decor pool and Jacuzzi. PLUS an amazingly large lanai! 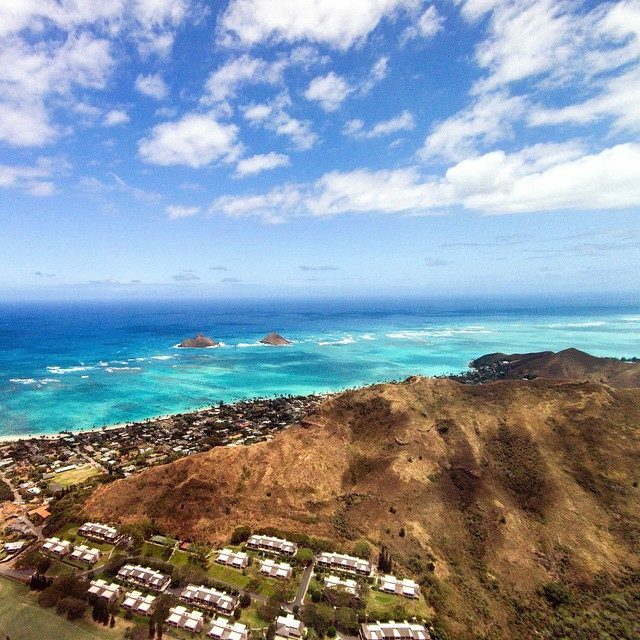 Enjoy all of this, while your Kailua Beach access is only 4 houses away! Quiet, while calming, this wonderful home features over 3100 feet of living area. There are more features than we can cover, so contact your realtor today, and let's get started! This highly desirable and peaceful waterfront corner lot offers the true Kailua lifestyle. Launch your kayak, paddle board, or boat from your private dock to navigate the Ka x2018;elepulu Canal. The main lower level home offers 3 bed and 2 bath, and features an open floor plan with a chef x2019;s kitchen, oversized appliances and double kitchen islands. The living room leads to an enclosed lanai that opens up to an expansive backyard with cabana, hot tub, and boat dock. Atop the newly built garage sits a 1 bed 1 bath legal ADU with a large kitchen, built-in office desk, and covered lanai facing the Ka x2019;iwa Ridge (Pillbox) Trail and is currently rented at $2,400/month. The home also has new roofs (2013 & 2018), 24 owned PV panels, ample secure storage, separate W/D areas and a tankless gas water heater. Just beyond the gated entry lies your tropical island retreat. Spacious, blended indoor/outdoor spaces compliment island living for pets and people alike. Sophisticated custom chef x2019;s kitchen, mahogany cabinets and stunning granite counters fuse to create the ultimate gathering place. Generous social areas for truly indoor/outdoor living and entertaining x2013; Hawaiian Style. Private, tropical, fully enclosed yard with salt water pool for your ultimate family gathering or pool party. Energy efficient P.V system and cesspool for reduced utility bills.